Place to oil in a non-metallic shallow dish and add the garlic, lemon rind and juice, herbs, paprika and honey. Season to taste with pepper and stir well until combined. Add the lamb, turning to coat, then set aside for at least 10 minutes. Light the barbecue or heat a griddle pan until smoking hot. Shake the excess marinade from the lamb, then place on the griddle pan/barbecue. Season with a little salt, then cook for 6-8 minutes, until cooked through, turning once. Remove from the heat and let rest for a couple of minutes. 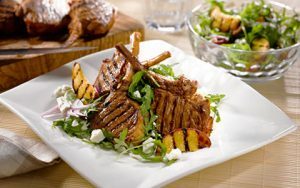 Serve the lamb on warmed plates with salad and crusty bread. Preheat your oven to 180c fan/gas 6/200c. Heat a frying pan over a high heat until hot. Once hot add 2 tbsp of the truffle oil and the butter. When the butter is foaming add the mushrooms and fry until lightly golden and soft. Season the mushrooms with sea salt and black pepper. Add the cream and bring to the boil. Once boiled turn down to a simmer and cook for 4-5 minutes until the cream has thickened. Add the baby spinach and cook for a further 1-2 minutes until the spinach has wilted. Stir the remaining truffle oil through the mix, taste and season again if needed. 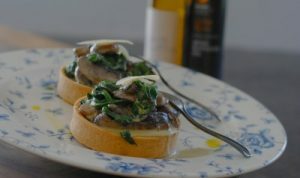 Spoon the mushroom mix into the tartlet cases and place into the oven for 2-3 minutes. Serve and top with a few parmesan shavings. Pre-heat your oven to 180c fan/gas 6/200c. Season the chicken fillet with sea salt and black pepper. 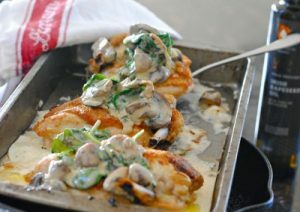 Make small pocket in each chicken breasts and stuff each one with the cream cheese. Heat a frying pan over a high heat. Add 3 tbsp of the porcini oil to the pan. Carefully place the chicken into the pan and sear well on each side until golden. Lay the chicken onto a roasting tray and cook in the oven for 16-18 minutes until thoroughly cooked through. Now make the mushroom fricassee. Heat the remaining porcini oil in a frying pan. Add the mushrooms and chopped shallot and fry for 4 minutes until the mushrooms are golden in colour. Add the chopped garlic and cook for a further 1 minute. Add the cream, bring to the boil and then simmer 3-4 minutes until thickened. Add the baby spinach leaves to the mushrooms. Season with sea salt and pepper and cook for a further 1 minute. Set aside. Remove the chicken from the oven and allow to rest for 4 minutes. Spoon over the mushroom fricassee and drizzle over a little more porcini oil. Serve.